Time for the Second challenge of the month at Word Art Wednesday! Todays' verse ios so reassuring, nothing is too hard for the Lord! When we walk with him and live according to his ways, there are no limits to the Blessings in our lives! I created my Design Team card this month using a printed image that I added ink to and the glazed with crystal effects. I also found a beautiful sequined applique in my crazy quilts stash! I've decided I really need to use up as much of the craft goodies htat I can with making new purchases. After two cross country moves, I 've really decided I need less stuff and more room! 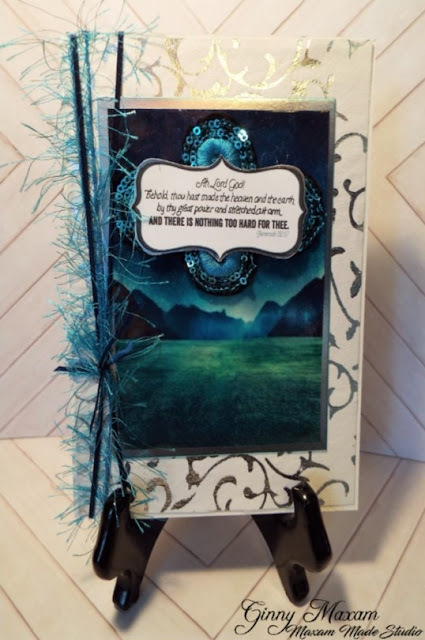 So here is my card made up of "stuff"
I hope you take the time to hop over to Word Art Wednesday and read Karen Letchworth's beautiful devotionl, make a card and share it with us before you mail it and you might win a wonderful prize!! Mm great card but not sure how you made it Ginny, my "stuff"doesn't end up like that... a printed digi??? What's the thing under verse????? .